Drake & Josh is a GBA game based on the Nickelodeon show of the same name. Taken from scenarios of several of the show's episodes, this game is a problem-solving, stealth, exploration game. In this run, the duo decides stealth just isn't their style, and rushes through all their problems. I have absolutely no idea why I downloaded this game. I just started the game and on the first level, found a glitch that allowed me to walk through doors. I actually wanted to do a 100% run that also grabs all items, and actually posted a route for it on the forum thread, but the luck required drives me away from doing it. A lua script with the game's address is also on the thread's first post. This game's levels are divided by "Chapters" with each Chapter consists of multiple episodes that all take place in a similar location. Pausing to skip dialogue is always faster than to get through the dialogue screens. If you turn south right after the 3 guys before the first switch, there's 2 red security cameras blocking the path. I cannot seem to go past them without getting caught, so I'm forced to take the intended route. The blue door to the right of the 2nd switch is actually a wall; if you toggled the stun state, you still cannot go past it. I had to wait a bit at the washroom area to recover the meter. The candied floor makes all NPCs face you, so I had to move carefully to avoid being seen. I also bumped into the girl before the keys to manipulate when she will turn. If anyone wonders why I sometimes use the pause trick on door transitions and not all the time, it's because sometimes, the time taken to pause and unpause is greater than simply waiting it out. The guitar state can be interrupted by walking towards either an NPC or a door object; doing so against a wall will not work. I cannot call Drake's girlfriend after this, so I'm forced to trigger a checkpoint then restart the section. This area is one of the few areas to benefit from this glitch due to all the doors only relevant for a 100%. At the gym area, I actually managed to clip into the benches after getting hit by the paintballs. I cannot replicate it, but I'm not even sure if it's useful. The robot dog section was one of the harder parts of this area due to the candied floor attracting thier attention. I manipulated the Janitor to go south so I can bump into him and interrupt the guitar state. Josh's puzzle section is completely broken in the Any% due to the pushing state. However, it remains intact in the 100% due to his run speed. Despite the lasers stunning you, it does not appear to be interruptable, hence the crate is the only thing that breaks this area. I honestly really tried to manipulate the sheeps; the first 3 sheep appears to spawn simultaneously, while the last 3 sheep can be manipulated separately from the first 3. I also had to take account of the sheep's wandering behavoir, and the fact that if they spawned too far, I have to throw them since I have ~450 frames of movement before they try to escape (causing another Drake-esque quicktime event). Oh, and sheeps run away from you as soon as you approach them in front, so I had to take that detour for the 6th sheep. For the pull switch, I can actually stop the door cutscene by moving further left, but it appears to be faster to run past it normally. The janitor in the 2nd section allows me to skip 2 areas of sheep. Thankfully, those sheep are also skippable in the 100% route due to a paintball section on the 3rd section. It is still faster to restart the last section, then pause away the dialogue then it is to trigger it. Also the black sheep ignores you in the stun state, so you cannot use it to get out of said state. I am unsure of the last area's sheep route. I feel like there may be a faster route, but attempting to test it gave worse luck for the sheep spawns. Area 4's 4th sheep had a bad spawn location when I came back for it, and I wasn't able to make it better. If I swapped sheep 3 and 4's order, it made the other sheep spawn far away instead. The black sheep had a somewhat bad spawn location, but when I made it closer it faced the entrance and would immediately stun me as I got near. So instead I manipulated the nearby white sheep to be spawn lower south, then use the sheep clipping glitch to trap the black sheep. I also managed to lure another white sheep to run near the doorway so I can grab it quickly. All these great spawns were rather ruined by the last 2 sheep's terrible luck. It does not appear to be possible to walk past the door at the end of the 1st section to skip the Cafe minigame. If there was a way to clip out of bounds as Drake, then that minigame could be skipped. The Cafeteria Panic minigame had terrible luck. While I could not figure out the RNG for this game, I found that delaying before ending the previous section changes NPC spawns, while delaying before pressing "A" to enter the minigame changes NPC behavior. Throwing randomly also appears to affect their behavior. Ideally, a TAS would get 3 NPCs to spawn, then they all immediately walk to the end, but I'm not even sure if that's possible. The part after the minigame is straight forward, and the only thing to note is that there may be a better way to go past the cameras with less delay. That red homework sheet at the beginning is actually just scenary; you cannot grab it even with cheats, and going past that roped fence does not lead to the end. Since getting stunned makes me able to walk through doors, there's nothing much to say except that losing the state using the janitor is faster than restarting from a checkpoint. I have to do this, since walking past the trigger will not load the new section I need to be. Instead, it leads to a dead end. Oh, and the paintballs interrupted the caught animation, so I was able to go past the camera. For the next part, it is still faster to push the crates past the first film projector than it is grabbing it because of cutscenes. This gave me a worse janitor spawn, but I still managed to save time. Before anyone asks, the thug won't chase you to the door, so I had to restart the stage at the crate room. The reason I have to push the crates is because the empty floor spots are one of the few things getting stunned won't help you bypass it. 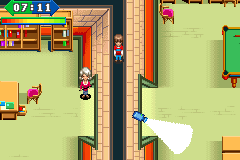 I also restarted the stage at the 2nd projector to both lose the state and manipulate the janitor to hit me later. I had to pause before grabbing the crate since it appears it won't let me grab on while the blue drawers are moving. For the next blue drawer section, I can also remove the stun state with the red lasers, but that is slower than restarting. While the stage is broken in the any%, it's rather intact for the 100% simply due to the fact 3 of the pages are located in a locked door such that the crate is north of the door. Since the push state actually does check if you're pushing south towards a door (sorta, it still softlocks), I have to do the puzzle there as intended. Because of the fact I cannot figure a way to get both the stun and guitar state simultaneously, this is one of the 2 stages that I'm forced to be stealthy. I cannot seem to manipulate away the fangirl I paused before, nor the janitor that bumps me midway. This stage is incidentally why doing the cafe minigame twice or to get Drake's last item is still faster than getting it at the intended stage, even with glitches. Exclusive to Drake only. By calling his girlfriend at around the same time as he collides with certain objects (doors/npcs), he retains movement, but everything else remains paused. The only thing that can be interacted with are switches and items, which means it's mostly limited to areas with long halls such as the school. Available to perform on both brothers. By autofiring "A" while stunned, you can immediately get out of stun, and lose most of your hit detection. Most objects can then be walked through. You cannot grab items, switches nor level triggers in this state, so I either get stunned again or restart the level to remove the state. This can alternatively be triggered by getting hit during a "cutscene" (ie. triggering a switch and while the camera moves, get hit by a janitor). The only way to trigger this simultaneously with the guitar state is to get hit by paintballs, which only appear for Drake at the school area, so the last level relies on this glitch exclusively. Available to Josh only. When pushing crates forward, the game developers forgot to allow doors to stop you when pushing from the sides and below. This allows 2 of the problem solving stages to be broken. Curiously, they actually did have hit detection when you try to push a crate towards a door from above it; Luckily this only affects the 100% route. End camera movement earlier - Once you hit a switch and the camera moves to the door, as soon as the door opens you can open and close it to immediately gain control again. This is only worth it if the camera moves far away however. Slightly faster diagonal movement - Moving diagonally makes you move at 204 rather than 272 speed. So if you want for example to move a bit up/down, it is sometimes better to autofire up/down while moving horizontally, since this makes the speed change from 272 to 204 every frame. This is occasionally slower however. Same applies to running with Josh. Start pipe flow early - At the pipe minigame, the game allows you to start the flow without ever placing a single pipe. This allows me to set up and playaround a bit while the soda flows. Skip dialogue - Press start 2 frames before the screen fades to black; this causes the dialogue to get skipped. Note: This should not be done at the end, since it may make the game stuck. Sheeps and walls - Throwing sheeps up/down while there's a wall to the left causes them to zip through and get thrown further. Same for a certain spot at doorways. Caught state - If you get caught, getting stunned, pausing, sheep escaping, calling girlfriend, etc. all interrupt the animation and allows you to continue. This is far less useful than it seems, and is used in 1 place. Ending foodfight early - While the goal is to avoid having 5 people reach the exit, they failed to actually check if that occurred, so as soon as 5 people/sheep reaches the end, you "win" regardless. Bumping NPCs - The NPCs immediately pause and face you if you bump into them. Thanks to their conic vision, they have a very narrow view to immediate sides of them. This can be used to make moving NPCs pause and also grab thier attention. Grabbing items and restart stage - Grabbing items remain grabbed even if the stage was reset via the menu/getting caught, so at the 100% run, it is beneficial to do this for far away pickups. Use only on 100% to reset the items since restarting stage also readds all the stage triggers, including the one for the food fight. Pull a crate up to a wall. Get stunned while pulling. The crate should get dragged into the same spot as you. Grab the crate again and get stunned. You will clip into the wall. Pressing start before dialogue appears - Once the faces pops up, right before the text appears, if you press Start, the faces go away but the text remains. Pressing A leaves the dialogue, but then the faces reappear on screen. During this time, if you trigger another dialogue, it softlocks the game. Getting infinite film rolls - At the last film roll, press start before the dialogue begins. Unpause, then repause and retart the room. You can now pick more film mores, and the counter will go higher than 4. Getting past 100% items - Grab 10 guitar picks, and go to that wall-less spot. This gives you the stage item and resets all the picks in the area. Do this 15 times more to get NPCs appear on the item screen. The 15th time crashes the game as the stage ends. Softlock w/ Drake - Call your girlfriend, and if you completed the input section too quickly he gets stuck and you're forced to reset the room. Samsara: Looks well-planned and optimized, however the glitch, game, and gimmicks get old very quick. Accepting to Vault.